Fire damage in a home. Once the fire is put out, the process to make things right again needs to begin immediately. Typically the facility is boarded up, and utilities should be contacted to discuss if shut off is necessary. Our equipment is designed to run off our truck-mounted generators and we do not require on-site power or water to administer a restoration campaign. Our restoration specialists are trained to securely board up the facility and prep the area for demolition, reconstruction and evaluation by the authorities and/or insurance companies. At KIC Restoration we understand the cost associated with downtime. Every day the facility or home remains uninhabitable is costing someone money and it is likely taking a toll a business or disrupting the balance of a home. We respond immediately; we have staff on call 24/7. We want to get you back in business as quickly as possible. Following the remediation now comes the part when someone needs take responsibility for putting everything back together. For example, drywall, texturing and painting are things that we typically handle in-house. Alternatively, we typically bring in our restoration contractors to install and restore cabinets, flooring, electrical, plumbing, tile, insulation, countertops, windows, roofing, etc. We work with the same companies on a regular basis and we know they are trustworthy and licensed contractors qualified to repair the damage in a way that is familiar to the insurance company claims adjusters. We are equipped to coordinate the reconstruction process in a way that is streamlined, effective and thoughtful in manner. Connect your insurance adjuster directly with the companies you plan to conduct the restoration campaign. Insurance adjusters are picky about whom they work with and if you not careful you could end up in a bind. Smoke particles can float around in the air for weeks without adequate ventilation or filtration. Deploy institutional grade HEPA filters get the air clean as soon as possible. Ensure that the team deployed to restore the site makes wiping down the valuable metal surfaces a genuine priority. Acids present in the ash have been known to cause pitting if this is not immediately addressed. 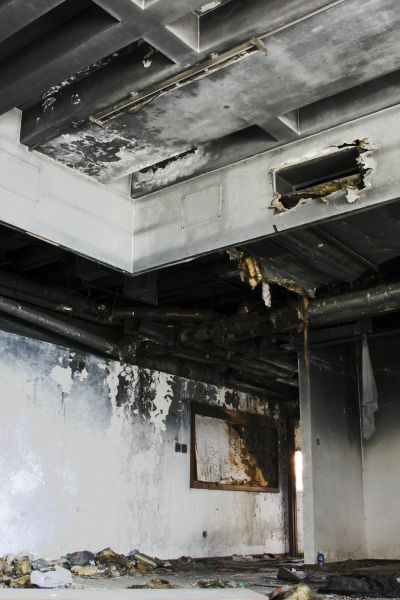 If you have any doubts or further questions, feel free to visit our Fire Restoration FAQs page.